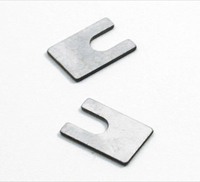 Shims — International Etching, Inc. Although this part appears to be very simple, only chemical machining could produce it. A series of 20 pieces of each thickness was required from a range of .0010″ to .0125″, each part being increased in thickness by .0002″. Thus 63 different thicknesses were required from stock availability of .004″, .005″, .008″, .010″ and .015″. The first step was to pre-etch stock strip down to each specific thickness, then chemically machine out each piece to a tolerance of +/- .002″ from each of the thicknesses and to properly label each of the 63 revisions. Two photo tools were required to account for differences in etch factor. Material was customer-supplied in 3″ width coil form. Shipping time: 14 business days from receipt of material.